Wow. 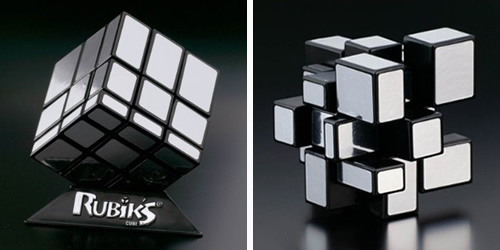 I mean, I may like Rubik’s cubes, but this one… Wow… I just wanna buy one to keep on my desk for decoration. I could change it up a bit every day just to keep things interesting. Anyway, this, as I’m sure you can tell, is a new twist on the classic Rubik’s cube. I once learned how to solve one, though I’m sure that I’ve totally forgotten now… I had it so I could solve it from anywhere in about 2 minutes… But now… Well, I’m out of practice, and proud of it. But this would be neat. Not so much to solve it, I think, (at least for me) but to just have sitting around. All the exterior edges are mirrored, and the only way to tell where they go is based on the size of the piece. But, as you can see, it does make for some awesome shapes. So, yeah. I do believe I’d use it for decoration, nothing more. Here are some links, if you wanna see a video of someone playing with one, or buy one from Amazon Japan.